You need at least two days to acclimate, so it says on the tour brochures online and everywhere. Not true! I think I needed a week to acclimate. But two days we stayed, in Cusco, the starting point for nearly all Machu Picchu treks. 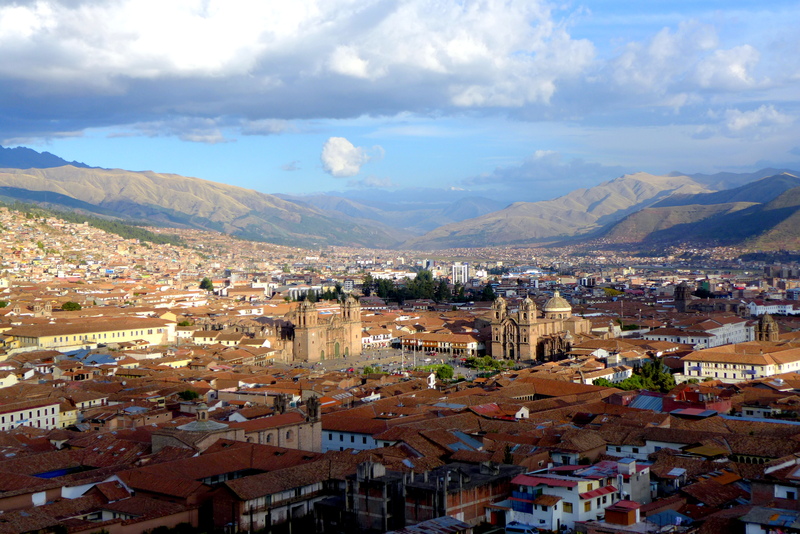 Our hotel, Qorikilla, was situated on the top of the hill with a gorgeous panoramic view of Cusco but comes at a price — in steps. Anything we wanted to do were down in the bottom of the bowl and to return, we must climb what felt like the equivalent of a 20 storey building, all while we attempt to acclimate to the 3,400 meter (11,200 ft) altitude. Good practice for the trek, we convinced ourselves. The view from our hotel window, Qorikilla! Soon after arrival we signed up for the Salkantay trek through Loki Travel agency across the street. 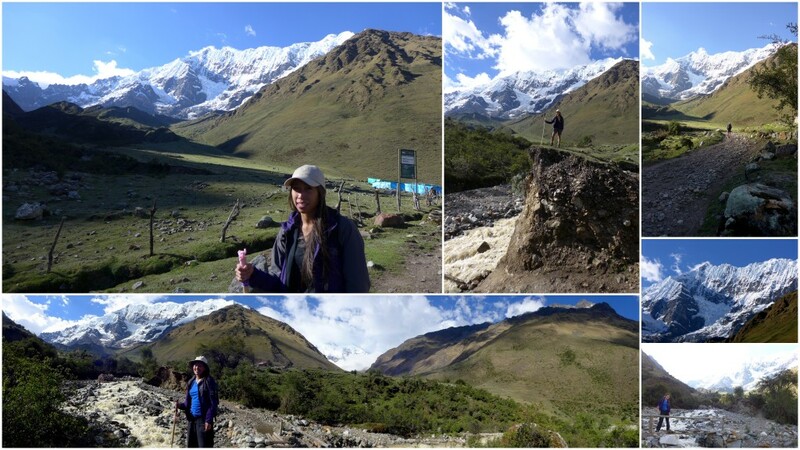 Salkantay trek covers a distance of 64-82 kilometers (40-51 miles) and is famed for it’s long route, high summit (4600 meters), beautiful sceneries, and diverse ecosystems. All inclusive, it was about $230 USD per person. Even after hearing the numbers, we felt decently comfortable with the choice. Afterall, Annie has been practicing and working out for this and I think I’m average fit, plus we did walk 14 miles a day in Lima easily. If an abuela can do it, we can do it. 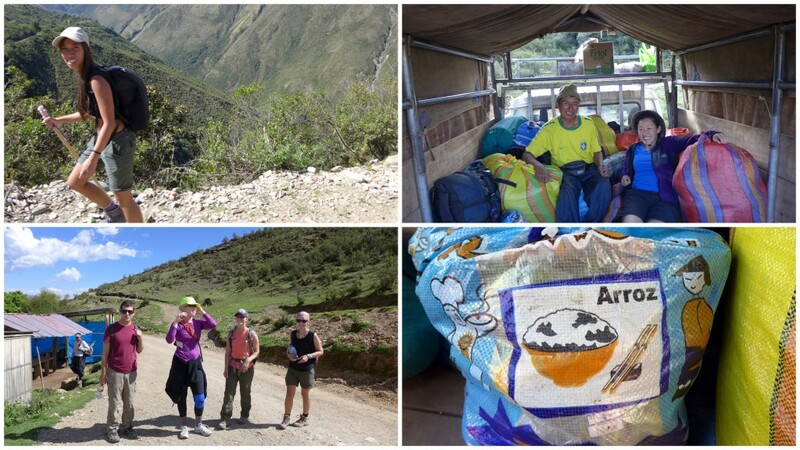 We bussed from Cusco to Mollepata and began the trek from the edge of town around 9 AM. In the first hour, our guide, Jorge, let us try the cactus fruit and showed us the red dye from cactus seeds that the local people use for textile but are now purchased by international companies to produce makeup and nail polish. He also talked about the eucalyptus trees that were brought in to stabilize the soil and prevent landslides, but are now invading native species because the tree absorbs large amount of water. The eucalyptus trees are the ones with a hint of silver-green seen spread on the hill. Once we got out of town, Jorge picked up the pace and I started to really feel a difference in air pressure and my breathing as we ascend. At first, Annie and I were close to the front of the pack. About 2 hours in, we fell behind and I constantly needed to take breaks or sit down. Must…take…breaks…every breath was a struggle! Photo courtesy of Annie. By the time we reached our lunch spot around 12:30 PM, seemed like others had been waiting for 15-20 minutes already and lunch was served immediately. The food was delicious as can be and the soup was excellent. I was able to finish the soup but had almost zero appetite for the main course. The lunch spot to the campsite takes about 3.5 hour. Annie decided to go right after lunch to get a headstart and be able to walk at her own pace. Meanwhile, I was chugging coca tea in hopes that it’ll kick in and help with the symptoms. Also tried to take a nap, though wood plank seats weren’t exactly siesta material. Around 1:30 PM, Jorge rounded the group up and sends us on our way. I felt slightly better after the tea and rest so I followed with confidence. Literally three minutes in I had to stop and take a break. Did some math in my head, at this rate, I’ll reach the campsite close to midnight. So I went back to the lunch spot and hopped on the truck with our guide, cooks and all the luggages. Annie’s face when the truck passed her by. Me and Manzana the cook chilling out back. Annie had a mix of expressions as I waved from the truck that passed by and left her in a trail of dust. Just half a mile up was a snack shop and Jorge had the truck wait while he went to get Annie because everyone else in the group are way ahead already. And Jorge was afraid that at her current pace, Annie won’t make it to the campsite before dark. Guess who’s on the truck with me now? LOL. Though surely with persistence and determination, Annie would have trekked to the campsite. If a puma doesn’t get her in the dark! And because of the truck ride, we arrived at the campsite at least an hour earlier than the rest of the group and had great lighting and lots of time to take as many pictures as we wanted. Oh, you win some and you lose some, not a bad trade considering the view! 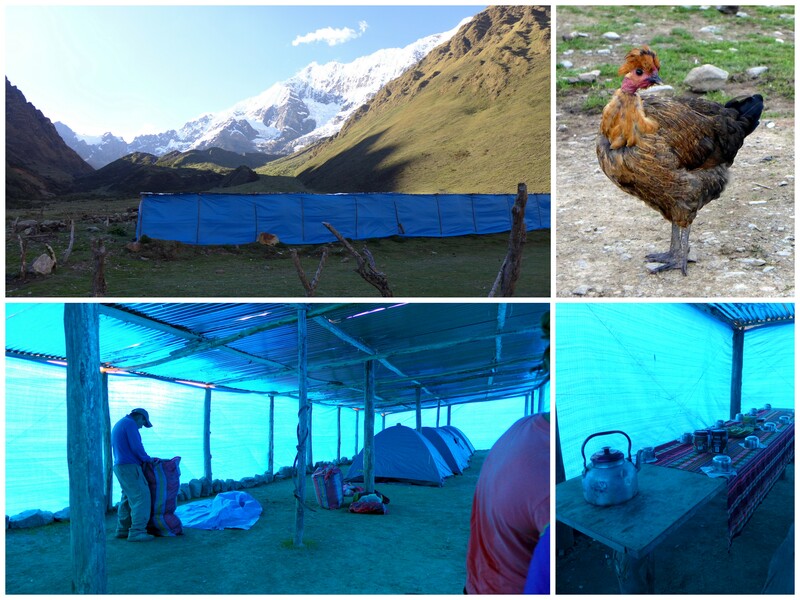 The campsite, situated at 3,870 meters, was about 1,000 meters higher than our starting point that morning. Temperature may drop to -10C at night with strong winds. The $40 soles we paid to rent the sleeping bags were well worth it. Campsite, campsite alp chicken, setting up tents and the welcome snacks. Manzana was a fantastic cook. Dinner was delicious and I felt well enough to eat again. The bathroom had a toilet and there are no mosquitoes. Life was good at 3,870 meters! At dinner someone mentioned the cloudless nightsky and I suddenly remembered that I brought my tripod exactly for this reason. I quickly gobbled down the pollo and rice then head out with my tripod. High alps + clear sky is the best possible combination anyone could ever hope for a starry night photo session! During this last photo exposure I also saw a shooting star. A much better good luck sign than getting pooped on by monkeys! After this photo session I added a new item on my to do list — watch a meteor shower from the high alps one day. Maybe with a llama on my side to keep warm because I was freezing my arses off to take and wait for these photos. By the way, thanks for bringing the camera over Annie! When I hit my limit with the cold I crawled back into the tent. Time check: 8:30 PM. We must go to bed in order to wake up at 4:30 AM for breakfast, then the steepest trek out of the entire route and ascend 800 meters in 6 km. That’s twice as steep as the first day. Though Annie and I had other plans…. Erin in her sleeping bag/chair combo looking mighty comfortable! Finally, Machu Picchu and Huayna Picchu!